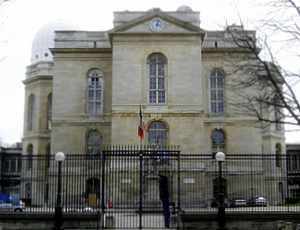 The Observatory of Paris, the National Astronomical Observatory, is the oldest operating observatory in the world. The Paris Observatory was founded by Louis XIV, at the insistence of Jean-Baptiste Colbert who saw it as way to improve France's ability to explore the globe by sea and to increase trade. Construction of the Observatoire de Paris began in 1667 by architect Claude Perrault and was completed in 1671. The building is oriented to the four cardinal points. The meridian of Paris runs through the middle of the building. It was Claude Perrault who also designed the Colonnade entrance on the eastern side of the Louvre. The Observatory of Paris was renovated and added to in 1730, 1810, 1834, 1850 and 1951. The latest addition is the Meridian Room, designed by Jean Prouvé. The Observatory of Paris continues to be one of the world centers for astronomic research. Gian Domenico Cassini was the first of four generations of his family to hold the post of director of the Observatory. On February 3, 1851, Leon Foucault first publicly exhibited his now famous Foucault Pendulum in the Observatoire de Paris. Prince Louis Napoleon, the future Napoleon III, asked for another demonstration on March 26, 1851, to be presented in the Panthéon. This revolutionary demonstration provided the proof, and still does, that the earth does, in fact, spin on its axis. Since 1855, Foucault's Pendulum has been hanging and swinging in the Musée des Arts et Métiers. During the recent renovation of this building, the 67 meter Pendulum had a temporary home in the Pantheon. It has since returned to the museum where it can be viewed. Due to its location in the middle of the city, light pollution has prevented the Observatory from being used for astronomical observations since 1960. However, the Observatory of Paris still analyzes astronomical data gathered from around the world and conducts research in astronomy and astrophysics. The Observatory also offers four graduate programs in astronomy and astrophysics. Public visits are available by reservation on the first Sunday of each month, except during August, starting at 2:30 p.m. The tour takes two hours. Fees are 5 euros for adults, 2.50 euros for students and seniors over 60 years old and 120 euros per group. Group visits, maximum of thirty people, are available Tuesdays and Wednesdays at 2 p.m.
Astronomical observational equipment can be viewed on these tours, such as the telescopes used when the Observatory first began. Also included on these tours is the first "speaking clock", created by E. Esclangon in 1933, as are the atomic clocks which set the time standard for the world, a function of the Bureau International de l'Heure, the International Time Bureau. The Cassini Room is part of the tour. This room is crossed in brass with the north-south meridian line. The 19th century Arago Coupola, also part of the tour, displays a telescope. In 1995, to honor François Arago, director of the Observatory of Paris from 1834-1853, the Netherland artist Jean Dibbets marked out the north-south meridian line that runs through Paris with 135 bronze medallions of 12 cm in diameter. However, since the release of a popular novel and film, several of these medallions have been stolen. They are set into the ground in such places as the Garden of the Luxembourg Palace, the Louvre and the Palais Royal. Inscribed on them is the name "Arago" and the letters "N" and "S", indicating north and south directions. If you follow these medallions to find the Inverted Pyramid of the Louvre Museum, or the Church of Saint Sulpice, you will miss them both by 100 meters. This novel should not be used as a source of accurate information on astronomy, theology or driving directions around Paris. The brass line running through the floor in the Church of Saint Sulpice is neither the Zero Meridian nor the so-called "Rose Line". What has been incorrectly referred to is an indicator line, part of the gnomon, a measuring tool installed here in 1727, used to pinpoint the vernal equinox and thereby determining Easter, which is the first Sunday after the first full moon after the vernal, Spring, equinox. The Paris Zero Meridian line, established in 1667, was used for centuries to calculate positions for naval vessels and distances, as well as setting the time standard. In 1884, a new international standard was designed, establishing the Zero Meridian at Greenwich, England. However, it wasn't until 1911 that France accepted the new meridian and established Greenwich Mean Time (GMT) as the standard in France. The meridian through Paris is now measured at longitude 2°20'14.025" east.